CONTINGENCY OPERATING BASE SPEICHER, IRAQ, June 3, 2010  Born and raised in a small town of North Dakota, Staff Sergeant Kevin L. Jahn was drawn to music at an early age. His father, Bill Jahn, played all kinds of music on the stereo after coming home from work at the pharmacy. Staff Sergeant Jahn would stay and absorb the music around him. The Valley City, N.D., native soon realized the drums were his calling. "It was something I was drawn to, unlike any of the other instruments. When I listened to music I would tap out the drum part at a young age," Jahn said. Having this natural ability to tap out rhythms, Jahn instinctively picked the drums in fifth grade  the beginning of his musical career. In high school, Jahn continued with his love of music by participating in the concert band, jazz combo and pep band when he was not playing sports. Jahn shared that his most memorable high school musical moment was playing in the pep band for basketball games. "When I was a senior in high school I didn't play basketball, so I was in the pep band. The pep band was a very integral part of the pre-game process," Jahn said, with a glow of nostalgia on his face. "Imagine an old auditorium basketball court with bleachers on both sides, and there's a stage on one end. We would set up on the stage and play a drum cadence as the team would rush out. I remember the crowd would go nuts." After graduating from Valley City High School in 1994, Jahn knew he wanted to go to college and study something he was good at. "When you are at that age and you're transitioning into college, you want to go into something that you know. I thought, 'I like music. Might as well make a career out of it.'" Jahn graduated from Valley City (N.D.) State University in 1999 with a bachelor's in music education. As a civilian, Jahn taught band and choir for two years at Devils Lake (N.D.) High School. His passion was still in playing music, though, and he looked for ways to become a professional musician. "The opportunity to play music as an actual professional and get paid with good benefits really drew me to the Army," said Jahn. He enlisted into the military in 2004, and after completing basic combat training at Fort Jackson, S.C., in April 2004, he went on to graduate from the U.S. Army Element School of Music, Little Creek, Va., for training as a bandsman with an emphasis in percussion, in October 2004. 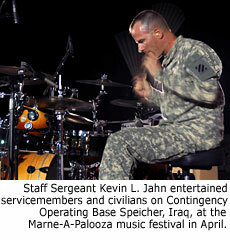 "Music is a very traditional part of Army ceremonies," Jahn said. "If you are going to have any type of ceremony in the Army ... nine times out of 10 there will be an Army band involved." Now, Jahn has the opportunity to play music every day. 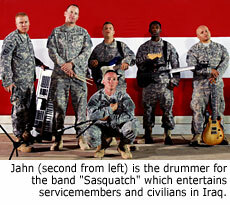 Drum beats filled the air surrounding the 3rd Infantry Division band's practice room, driving the jazz band's beat and giving "Sasquatch," a top-40 hits band, its backbone. Jahn is currently supporting Operation Iraqi Freedom at Contingency Operating Base Speicher, near Tikrit, Iraq, as part of the "Task Force Marne Band." He is a member of one of the most highly decorated divisions in U.S. military history. The 3rd Infantry Division earned its nickname, "The Marne Division," by defending the Marne River in France during World War I. Since that time, the division has had 51 Soldiers earn the Medal of Honor and has the two most decorated Soldiers in the military, Audie Murphy and Maurice Britt. 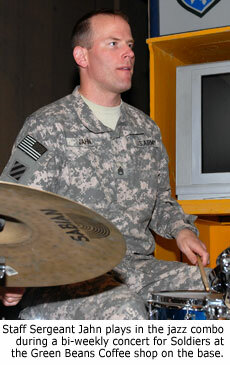 On an average day while deployed to Iraq, Jahn's job consists of being an assistant team leader as well as a percussionist. He takes care of Soldiers under his leadership and is conscious of their welfare and morale. He also practices with the two bands  the Task Force Marne Jazz Combo and Sasquatch. During his down time, he enjoys playing guitar and exercising. All the hard work ultimately comes down to entertaining and creating a relaxing atmosphere for Soldiers throughout Task Force Marne, boosting motivation to keep Soldiers strong and vigilant. Most may not think of jazz and popular music when they think of military bands. However, music has a universal appeal. By offering a wide variety of music, Jahn is able to reach a wide variety of Soldiers. "Music provokes an emotion ... whether it would be emotional or spiritual in any person no matter what their heritage, their nationality, or the language they speak," Jahn said. "Everyone hears the same. Whether you like it or not you're still having some type of emotion. Everybody on the planet can relate to that." U.S. Army photos by Sgt. Jessica Rohr.